Hi there! I am a stay-at-home mom with two sweet, amazing children, ages 11 and 5. I have many years of experience with babies, children, and adolescents stemming from my career providing therapeutic counseling to kiddos in transition (foster care and agency placement). 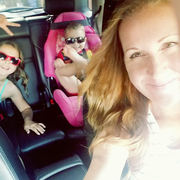 When my kiddos were born, I decided to leave my career to focus on them. I missed working with families and children, so I nannied for 2 wonderful families, to socialize my babies, as well as to continue serving as a care provider. It worked out so well, and I have become very close with the families with whom I have worked. I am open to providing care in your home or mine. I am very clean, creative, caring, have safe transportation, Christian, and reliable. I hope there is a little one out there who would benefit from playing and giggling with my little guy. He is Read more very sweet, and would enjoy a playmate. My son has low immunity, and recently had to un-eenrollin his awesome preschool due to the flu season. Otherwise, he is happy and healthy, and would love a friend to play with. I look forward to meeting a family who needs a nurturing, part-time person to keep their little one safe and happy! My daughter is currently in school, and I transport my neighbor's children to and from school, so I am available from about 10am-2pm. But those hours will be more flexible when school lets out.